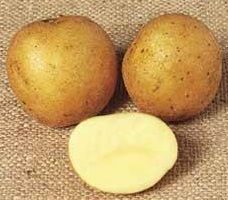 The Maris Piper variety first appeared in the UK in 1966 and was the result of a massive potato breeding program at the Plant Breeding Institute in Cambridge. The key benefit of this variety was its resistance to the Potato Cyst Nematode (Globodera rostochiensis) commonly known as eelworm and it is has retained that resistance throughout its life. It is the most commonly grown potato variety in the UK because it is a good all rounder and has good storage capabilities which the supermarkets find convenient. The parents of Maris Piper are (CPC 1673 x Ulster Knight) x (Arran Cairn x Herald). There are three key reasons for the amateur gardener to grow this maincrop potato variety, the first being the high yields. Not all the potatoes reach maturity, a few ending up as just marble size, but overall this is one of the most productive potato varieties. The second positive is that Maris Piper keeps very well, longer than most other varieties when harvested and stored correctly. Their final crowning glory is that the are the ultimate all rounder. Not only does almost every chippie in the country use them but they are excellent for baking, frying and boiling. Disease resistance is not one of their strong points for the amateur gardener. The commercial producers grow them with a frightening array of chemicals and fertilisers but the amateur does not have access to these, nor would they want to. They have low resistance to dry rot, blight, powdery scab, common scab and some forms of eelworm. Slugs find them tastier than many other varieties. This is a particularly common variety and can be bought online, in garden centres and the diy stores. They are also sold by some of the discount supermarkets at low prices - most years they appear in Lidl, Aldi, Wilkinsons and even Poundland from the middle of February. If you want to keep up to date with when they are available at the discount store then join our Facebook page where we post details as soon as they become available. Suttons Seeds (a GardenFocused approved supplier) sell Maris piper seed potatoes which are not only correctly certified but they are graded by size to avoid unduly small seed potatoes being sold. Click here for more information and to buy Maris Piper online. A 1kg bag will contain about 11 good sized seed potatoes. The key qualities of this variety are the high yields it regularly gives, long storage capabilities and good all round cooking qualities. Many of these qualities can be found in the variety Valor. Two other maincrop varieties which may fit the requirements are Kerr's Pink and Desiree. For other potato varieties which we have fully reviewed, click the drop down box above, select a variety and then click the More Information Button. In all the tests we have conducted and those we have researched, there is no detectable difference between maincrop potatoes which are chitted and those which are planted directly in the ground. However if you want to stick with tradition and chit your Maris Piper potatoes, we recommend that you start chitting / sprouting this variety in the third week of February. This will give them four to five weeks to develop healthy sprouts just at the time when they are ready to be planted out. Keep the potatoes in cool but light conditions to ensure they grow short, green sprouts. Click here for our page dedicated to chitting / sprouting potatoes in the UK and Ireland. Maris Piper potatoes are maincrop potatoes and they are ready for harvest, if conditions are correct, 18 to 20 weeks after the seed potatoes are planted. The key factor governing the time for planting all potatoes is the date of the last frost in your area. Even a touch of frost can damage potato plants if their foliage is above ground, an unexpected severe frost can kill them completely. The date for planting Maris Piper potato seed can be calculated on the basis that seed potatoes will take four weeks before they appear above ground. Given also that you want them to appear above ground only when the danger of frost has passed (the last week of April 2017 is the UK average) the last week of March is about right time to plant them. The harvest date for all potatoes is not only dependent on when you plant your seed potatoes, it also depends on the weather conditions throughout the growing season. But on average you can expect your potatoes to be ready for harvest some time between the first and third weeks of August 2017 in your area of the UK. The table below sets out how good or bad Maris Piper potato plants are at resisting common pests and diseases in the UK. The 0 point is average with minus (red) values showing lower than average resistance and plus values (green) showing higher than average resistance. Overall, this variety is not one we would recommend to the average gardener in the UK. USE: Very adaptable for cooking, use for chips, frying, boiling, mash and roasts. TASTE AND TEXTURE: Low in water content, Maris Piper potatoes have excellent taste.